Roots are dark and feathery, only extending into the soil during flowering. Plants float on and extend above the water due to enlarged-bulb-like petioles. Leaves are thick, shiny, bright green, 1-5 inches in width, and are kidney-shaped, or slightly concave. Flowers are conspicuous and lavender, in groups of 8-15 atop a stalk reaching 16 inches. Flowers are 6-petaled, the central lobe of which has a yellow oval-shaped spot. While rarely observed, fruit is a 3-celled capsule, containing many seeds, found in a submerged, withered flower. Ecological Threat: Alters native vegetation and fish communities by lowering light penetration and dissolved oxygen levels. Impedes boat traffic on rivers and waterways and clogs irrigation canals and intake pumps. Biology & Spread: Primarily reproduces vegetatively, via fragmentation and offshoots of the branching stems. Will also reproduce via seed production in favorable conditions (high temperature and high humidity). Peak flowering occurs in late summer and early fall. History: Water hyacinth is thought to be native to the Amazon River basin of South America. It was introduced to the United States in 1884 at the Cotton States Exposition in New Orleans, Louisiana. It spread across the southeastern U. S. and was identified in Florida in 1895. It was reported to be in California in 1904. 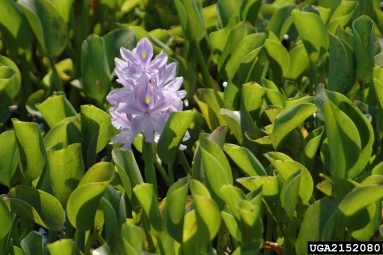 U.S. Habitat: Water hyacinth will grow in a wide variety of aquatic habitats including lakes, ponds, rivers, wetlands and marshes. It will grow most prolifically in water of high nutrient content; it has been used in wastewater treatment facilities. It can withstand drastic fluctuations in water level, flow rates, acidity and low nutrient levels. These characteristics make it a popular plant for residential water gardens. Distribution: Current distribution includes all of the southeastern states, New York, Virginia, Kentucky, Missouri, Alabama, Texas, Arizona, and California. 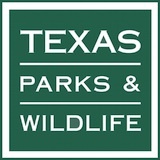 It has been listed as a Federal Noxious Weed and is prohibited or restricted in three states. Avoid introducing this plant to local waterways. 2,4-D and glyphosate herbicides are only effective on small populations. Plant harvesting machines/choppers or complete drainage is necessary for large infestations. Care should be taken to control nutrient inputs from the surrounding watershed. The Quiet Invasion: A Guide to Invasive Plants of the Galveston Bay Area (www.galvbayinvasives.org). Lisa Gonzalez and Jeff DallaRosa. Houston Advanced Research Center, 2006.